2017 marks the 35th anniversary of hosting a triathlon in the Columbia Valley, affectionately known to Bruce as the “Heart of the Canadian Rockies”. The town of Invermere and the surrounding area on both sides of Lake Windermere are the staging grounds for the Heart of the Rockies Triathlon events. Swimming takes place in the “magical waters” of Lake Windermere for the Lake Windermere Open Water Swim event and Sunday’s adult triathlon which each finish in James Chabot Provincial Park and is the focal point and transition area for the Heart of the Rockies Triathlon; Cycling takes place on the challenging, scenic Westside Road, and the run course heads east over the Columbia River along Lakeshore Drive, ascending through treed pathways to scenic mountain/lake views to the north and south of the valley. Although the run is a challenge, the consolation is that participants finish with a 2km incredibly scenic downhill to James Chabot Provincial Park. In the world of triathlon, you will not find a more spectacular race venue than Lake Windermere in the foreground of the majestic Fairmont Mountain Range (Rocky Mountains) as a backdrop. As an added bonus, the transition and parking facilities are within 100 meters of the start and finish – again, it does not happen anywhere else. In 2015, cash prizes were awarded for the first time for the Individual Sprint event. The Sprint distance event allows 16 and 17 year olds to race individually, bridging from youth triathlons (Young Hearts Triathlon) before moving on to the Individual Olympic distance event as an 18 year old. In 2017 and after many requests, we have added a “Team Sprint” distance event, and additionally, we now have a “Youth” Team Sprint distance event, exclusively for 12-15 year olds. Hosting our Team Olympic event is very satisfying for us as race organizers because it provides families and friends the opportunity join together to compete as teams. As of 2017, our Team Sprint events will also provide that same opportunity to those who wish to participate in a shorter distance event. For many years now, we have enjoyed meeting and seeing participation by the grandchildren of many of our participants. It has been a focus of our organization to “BUILD LIFESTYLES”and the participation of parents and children at our events proves that mentoring and healthy parenting does have a very positive impact. We hope that by offering these annual events, we may inspire adults and children to actively prepare for events throughout the year so that event participation makes them feel good about themselves and is a positive and enjoyable experience. We believe this may lay the groundwork for to continue to focus on leading a healthy lifestyle. There have been significant additions to the Young Hearts Triathlon, the most significant change being the move from James Chabot Provincial Park to Kinsmen Beach in Invermere. After two years of flooding that impacted the cycle and run course, plus the increased tourist traffic near the transition and the surrounding area, this event was moved to Kinsmen Beach, which provides a more contained, safer racing venue for children. The move to Kinsmen Beach proved to be well received by both children and parents. The large “barge” and unique deep water start for all age groups is enjoyed by the children as they jump or dive in for the one directional swim to shore. Parents of the youngest age groups join their children in the water and are welcome to use various swim aides to assist them to shore. After exiting the swim, there is a short run to the transition area/bike racks and volunteers lead them to the bike/run course and a paved road with slight inclines and descents much to the delight of the children. The race distances are of varying length depending on the age group, with older age groups completing more loops in order to complete the total distance required. Every competitor receives a medal once they cross the finish line and snacks and refreshments are provided for all. I never thought my idea to host a triathlon in the Windermere Valley in 1983 would result in hosting triathlons for the next 30 years. It began with the iconic Windermere Loop Triathlon and its one-directional race course and off-standard distances (point to point swim of 2150 m, 47 km cycle and 12 km run) which circled Lake Windermere. For the price of a bottle of rye, the distance from Timber Ridge Beach to the Lakeside Inn was professionally surveyed. In 1983, the first Windermere Loop Triathlon was held in late July and there were 56 competitors, mostly novices. I first read about triathlon in 1983 while vacationing in Costa Rica. For me, Bruce Stroud, the Windermere Loop Triathlon became only my second triathlon competition. My first triathlon was very poorly organized and consisted of a 50 meter pool swim (where the volunteer lap counters miss-counted and told some competitors (who believed they had finished) that they still had four laps to go. Other competitors were fished out of the pool four laps early, which lead to arguments between competitors and volunteers. Crashes occurred on the bike course which was a shopping center parking lot consisting of tight turns and many laps in order to complete the 40 kilometers. There was lots of confusion on the run course also. That race, which shall remain unnamed, was the impetus that led to my idea of organizing a triathlon in Invermere. So, in fact, I owe a thank you to that race and the organizers as it directed me to fumble my way through the many experiences of being a Race Director. In those days, there were no wetsuits (vaseline & lard), no helmets, no bike racks, no clip-in peddles, no aero bars, no body marking and no triathlon organizations with a set of rules to follow. Timing results were manually calculated using a wrist watch. Carol Gibson, one of Canada’s premier cross-country skiers, was the winner of the ladies category and Michael Dyer (a fellow navy brat) won for the men’s category. In 1984, the Windermere Loop Triathlon Relay was introduced, held on the August long weekend, and consisted of 75 teams in the very first year. 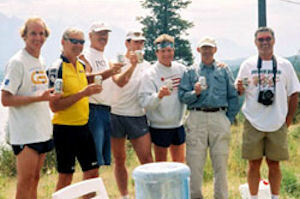 To this day, people who participated on a team in that 1984 event continue to participate on teams in the Heart of the Rockies Triathlon Relay event. The swim course of the Windermere Loop Triathlon originally was a straight ahead swim of 2150 meters from Timber Ridge beach to the Lakeside Inn, using the Lakeside Inn as the beacon (along with car headlights) and sighting landmark for swimmers. Logistically, it was an incredible hassle to transport bus loads of swimmers to the race start but it was also the ultimate straight ahead swim course as there was no turn-around. In 1993, the swim course was changed to an out and back, eliminating the transportation issue. The original Lakeside Inn, which had always been an integral part of the event, was built during the 1920’s and burned down in the 1990’s. The post-race awards however continued to be held on the lawn of the Inn, despite the boarded up, charred remains that were very visible. James Chabot Provincial Park had not been established at that time so the transition area for the race was the roughly gravelled parking lot of the Lakeside Inn. The cycle course led up through the mountain town of Invermere heading south for approximately 20 kilometers on the scenic, isolated and safe Westside road, before turning onto Highway 93/95. 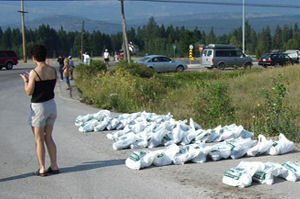 Cyclists crossed the highway and headed north past Fairmont Hot Springs for 18 kilometers to the run transition area at the junction of Highway 93/95 and the Windermere Loop Road. The run course began there and headed east on Windermere Loop Road toward the mountains, switching from pavement to gravel, while running along the foot of Mt. Swansea with the spectacular views of the Purcell Mountains in the distance. The 12 kilometer distance consisted of undulating roads and ended with a 1 kilometer downhill to the finish line at the Lakeside Inn. Although the Windermere Loop Triathlon was not an easy course, many folks chose it as their first race due to the laid back approach, little hype, no egos, and little ceremony. The awards ceremonies on the lawn of the Lakeside Inn, where the famous 20 ounce beer mugs (the most coveted prize in triathloning???) were awarded, was an experience well remembered as the sun shone and the beer flowed. Participants were satisfied that they had accomplished something athletically worthy . As one fellow remarked a few years ago, “I have many race shirts but the “Loop” shirt is the one I wear the most”. For a long period of time, there were two separate races; the Individual event and the Relay event, which were held on two different weekends. Why? I cannot remember why, except that it seemed they should be treated as two separate events. In the early 1990’s, we finally decided to combine both events to a single weekend on the August long weekend. What a relief for everybody……. volunteers, athletes and myself!!! In 1991, the relay entries totalled 154 teams, however, Individual entries seldom topped 125. There was an incredible allegiance to the “Loop” by some athletes, including Bernie Dupuis who competed in the Individual event in all 23 “Loop” races and 2 “Heart” races for a record of 25 continuous years of triathlon racing. The “Loop” was more noted as a recreational and fun event, so the uniqueness and novelty of the race began losing its appeal to the upcoming crop of athletes who were looking for events with standard distances and the sanctioning of a triathlon organization. The “Loop” was never a sanctioned race but I had hoped to keep it going for 25 years. However, in 2006 after much contemplation, and 23 years, I decided to change to a sanctioned, Olympic distance race with a new name. What to name this new race? While on a training ride around the lake one beautiful summer day, looking across the lake from Westside Road on to the Fairmont Range, an appropriate name for this new triathlon hit home. For those who remember the front of the “Loop” shirt, under the lettering and logo was also included the text that read “in the heart of the Canadian Rockies” and Invermere, BC below it. It was that slogan “in the heart of the Canadian Rockies” that inspired the name of the new event which became known as “Heart of the Rockies Triathlon”. I’m not sure if Invermere is geographically located in the “heart of the Canadian Rockies”, but it is for me. You will notice that the logo for the Heart of the Rockies contains the same symbols and arrows for the three disciplines as those of the “Loop” logo. Kurt Reichel, a well known local artist, created all the unique logo designs and maps over the years and incorporated them into the new logo. In my opinion, one cannot shape an event until a logo is created that matches the event. Kurt certainly visualized the concept and continues to provide that creativity for us. In 2006, a new sanctioned Olympic distance triathlon race began with a new format, change of date, and change of name. The “Heart” now has only one transition area in James Chabot Provincial Park on Lake Windermere. The “Loop” had two transition areas; the swim/bike transition was just beyond the beach of course, and the bike/run transition was 8 kilometers away from the finish line on Highway 93/95, meaning that participants had to retrieve their bikes after the race or have someone pick it up for them. One transition area is definitely easier for everyone. Under consultation with a carpenter, I constructed bike racks to accommodate 225 bikes. Bike racks were not available for the “Loop” and participants simply laid their bikes on the grass. Substantially designed bike racks are definitely a necessary part of triathlon. The current race course established in 2010 is the final and, I believe, best course layout of the “Heart”. There were some radical changes during the first years of organizing the event. The original run course led north to the small hamlet of Wilmer, however before reaching the turnaround point, there was a very nasty climb of over 1 kilometer. It also included crossing a CPR railroad line and although there were few trains, it was still necessary to contact the road master for the schedule between 10:00 a.m. and noon. The road master has the power to delay trains, and I believe he made that happen once. The following year, I rerouted the run to the bridge, eliminating the railroad crossing. Finally, a local triathlete, Sanford Schmid, suggested a change to the current route, heading east over the Columbia River bridge. This incredible run is due to a 20 meter dirt trail (only familiar to a local) which connects from the highway to Lakeview Dr. I had used the trail many years ago, but had completely forgotten about it until Sanford reminded me. The course follows the beautiful shoreline of Lower Lakeview, Lakeview Meadows, and upper communities high above Lake Windermere with a 360 degree view. The final 1.5 kilometer of the run course finishes just like the “Loop”, downhill with a long distance view of the finish line from the top of the Althalmer Road hill. The downhill over the Columbia River Bridge and short flat run to the finish line conjures up a lot of memories for me as I have watched thousands of racers over the years “bringing it home”. I began mulling over the idea of establishing a youth triathlon after seeing participating parents with their children at the race package pickup. So on Valentine’s Day of 2009, we sent out a mass email to past adult competitors announcing that we would host a youth triathlon to be held the day before the “Heart” event in order to make the weekend a truly shared family affair which fit nicely with our “building lifestyles” theme. The response was very positive but we decided to limit the number of youth participants to 100 during that first year. The inaugural race filled up weeks before the registration deadline. Needing a logo and a name to build on, the name “Young Hearts” was chosen, since they are truly young hearts. Kurt Reichel was again called upon to create a simple bold logo designed with a large red heart surrounding the swim, cycle and run symbols that were part of the “Windermere Loop” logo back in 1983. The most unique feature of the “Young Hearts” is the swim start. Children are picked up at shore (one age category at a time) and transported on a nicely carpeted barge to their start position where they enter the water and swim one direction to shore. It’s just like the old “Loop” days; one direction, point to point. With parent involvement, it is a deep water start (no walking) for all age groups, who are escorted in the water under the watchful eyes of lifeguards and volunteers offering assistance to shore. A final addition in 2011 that seemed natural was to introduce a Sprint distance race. This additional event allows us to provide a race for 16 and 17 year old athletes who are not able to compete in an Olympic event until they reach the age of 18. The Sprint also provides an event for others who take Sprint distance racing seriously, as well as novices who “want to get their feet wet” in the sport of triathlon. Creating a course for the swim and cycle distances was easy since it became the same route as the Olympic course by just halving the distances. Designating the run course was a little more difficult even though most of the Sprint run duplicates the Olympic run. It was necessary to include a brutal uphill climb for the Sprint runners in order to avoid congestion and crossing over the path of the Olympic runners. Fortunately however, all runners are treated to the same downhill finish from Athalmer Hill. Our race timer, Jim Clampett of Springbok Timing, has been successfully capturing race times for each competitor for many years now, even though we do not use chip timing. Hosting the “Young Hearts Triathlon” made me aware of just how long we have been organizing these events. Amazing friendships have been created among athletes who race and compete together. In one particular year, there were 12 teams whose members were from the same family. They created their own t-shirts and on the back was a great slogan – “IT’S ALL RELATIVE(S)”. I’ve had athletes tell me that they plan their vacation around the date of race. We have seen participation by the sons and daughters of many of our past entrants from the 80’s and 90’s who are following in their parents’ footsteps. Now we are also seeing participation by the granddaughters and grandsons of those past entrants. This is classic mentoring! I salute those grandparents and parents and their strong families. I also salute the individuals, family teams, teams of friends, and teams put together at the last minute. Thanks to our volunteers who come together on request, helping with the continuation of an event that many have been a part of and supported for many years. Thank you also to the many sponsors providing cash or product and supporting the race events. It has been a pleasure to meet so many incredible people over the years, and to have established enduring friendships and associations as a result of a race that began 30 years ago. We have hosted world champions, Olympians, and some premier Canadian triathletes over the years. We had never provided cash incentives prior to 2012 nor hosted a pro-triathlete. In 2012, we decided to offer cash to the top male and female winners as well as providing everyone with an opportunity to race in one the most spectacular triathlon venues in the world………….”in the heart of the Canadian Rockies”. So there you have it……some history of triathlon in the Columbia Valley. I have many of my own personal stories, and I’ve met a lot of people with stories and fond memories of visiting the Valley on a hot summer weekend to race in a triathlon. It’s always a pleasure to see someone wearing one of our race t-shirts and it is especially enjoyable to talk with past and present participants!